The PENC-500 industrial computer workstation enables you to benefit from the functionality of a PC in industrial areas. 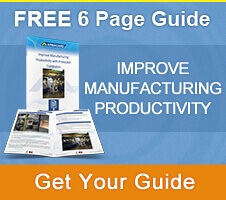 The workstation allows a PC to run uninterrupted in hazardous conditions, which increases system uptime, and results in improved shop floor efficiency and output. 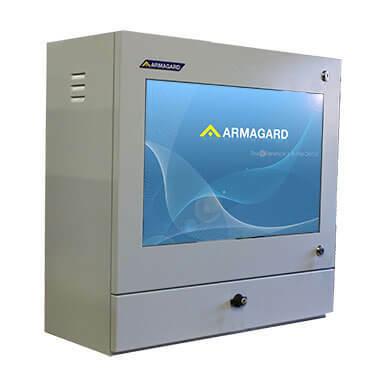 The PC is so well protected that it also offers greater systems protection as a whole, and ensures that your manufacturing processes continue without interruption. The Industrial computer workstation offers a lower total cost of ownership compared to an industrial PC, and, because of its longevity and the protection it provides to PCs, the workstation offers an excellent return on investment. 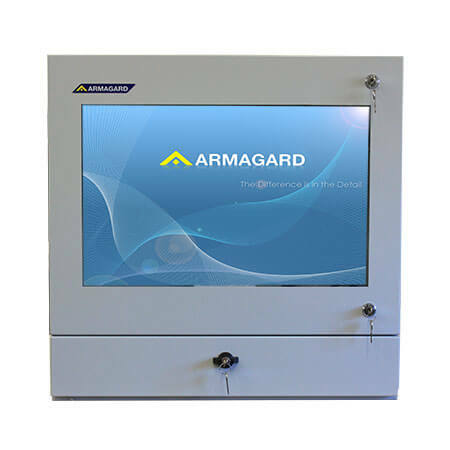 As an all-in-one unit, which is sealed against dust, liquid, grease, physical impact and theft, the PENC-500 series provides PCs and 24” screens with protection against the hazards of the industrial workplace. The Industrial computer workstation accommodates widescreen 24” monitors, and can be fitted with a keyboard shelf, a sliding keyboard tray or an integrated membrane keyboard. 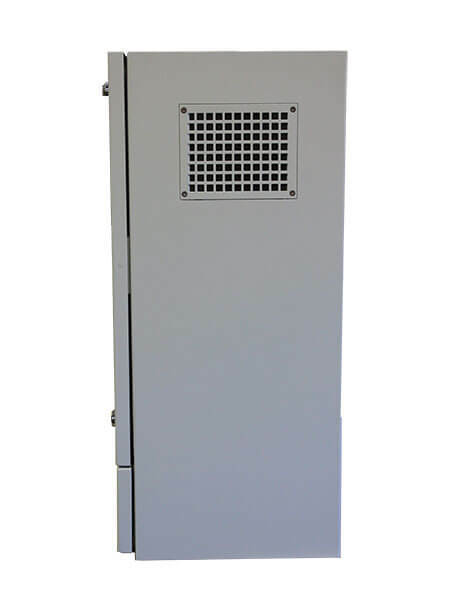 The enclosure is manufactured from powder coated mild steel, and is rated to IP54/56/65. As a result, you benefit from the efficiency of having a PC on the shop floor, while being assured that it is fully protected. The workstation accommodates computers and screens up to 24” with VESA mounts, so you can choose and install the most optimised computer system for your needs. The enclosure houses the computer in a climate-controlled environment, which includes fans, vents and surge protection. As such, the computer has a long lifespan in a ventilated, cooled and filtered environment, without problems caused by overheating and airborne particulates. The enclosure itself is sustainable for up to ten years, so offers an excellent return on investment. 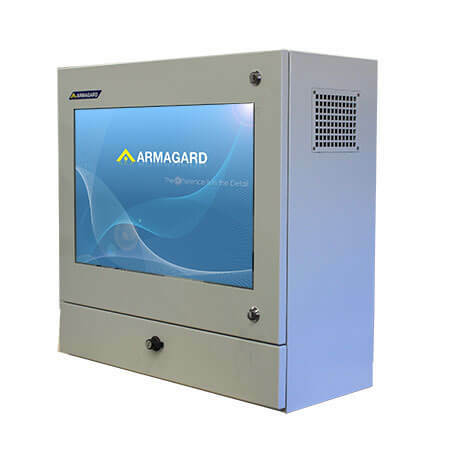 The industrial computer workstation can be mounted on a wall or stand, which allows you to position it in the most convenient location for you, and, with four models available, you can choose the most optimised setup for your manufacturing shop floor. Manufactured from powder coated mild-steel The industrial computer workstation ensures that the PC and screen are fully protected, which reduces maintenance, downtime, and cost. Shatterproof polycarbonate window The polycarbonate window is 30 times stronger than glass. In the unlikely event of a breakage, the shatterproof window will not contaminate your production line with debris. Fits computers and TFT/LCD monitors with VESA mounts (up to 24") Purchase the computer system of your choice, or save money by using a computer and screen you already own. Water repellent seals Seals prevent ingress of liquids through the door, locks and window, allowing you to easily wash the enclosure. Surge protected four way mains distribution Equipment is protected from electrical spikes, which ensures the longevity of components. Internal fans Internal fans and vents maintain a stable temperature, which extends the computer’s lifespan. 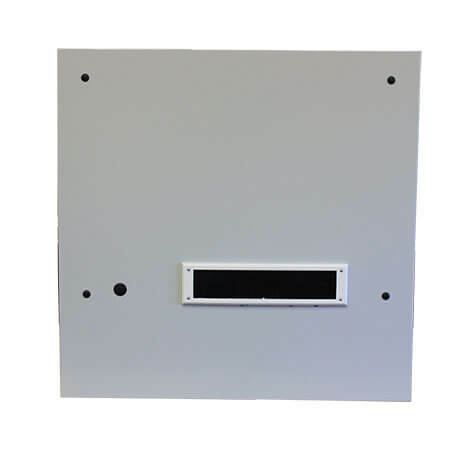 Flexible mounting You can mount the enclosure in the most convenient position for you, either on a wall or stand. Customisable Choose the most appropriate keyboard and mouse option for your needs: a fixed shelf, sliding tray or integrated IP54 membrane keyboard and mouse touchpad. Lockable Two key operated locks protect the industrial computer workstation from tampering and theft.